It is 9.20am on a school day. You are driving at 60 km/h, the same speed as traffic around you. You pass this sign but the other cars do not slow down much. What should you do? It is 9.20am on a school day. You are driving at 60 km/h, the same speed as traffic around you. You pass this sign but the other cars do not slow down much. What should you do? A. Slow down immediately to 40 km/h or less even though other drivers want to go faster. B. Drive at the speed of the other drivers because it is safer to go with the flow of traffic than slow others up. C. Stay at 60 km/h because it is nearly 9.30am and the times on the school sign are only advisory. Correct. 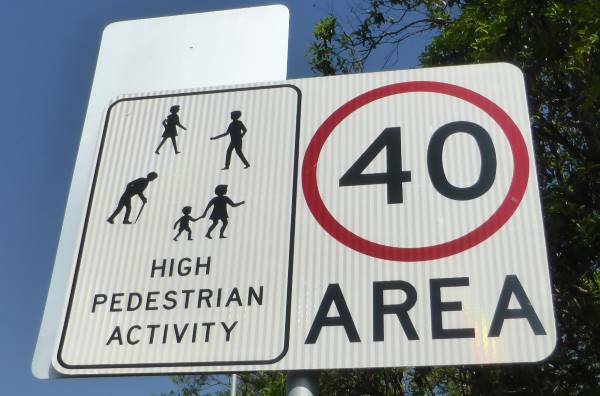 The speed limit is 40 km/h because there may be children around.